It took a long time – over eleven years – but together we made a difference for the river. The Vermont Yankee nuclear plant stopped producing electricity on December 31, 2014. Now the focus is on the decommissioning of the Entergy plant. It is too soon to know what issues might affect the river during closure. CRC feels it is important that the site return to reusable status as soon as possible. That means removing the plant itself, safely and in a timely manner. Having an old, decrepit nuclear power plant on the shores of the Connecticut River is not good for the river and those who use it. CRC will be at the table during the planning for the decommissioning of the plant. The Speaker of the VT House appointed CRC Upper Valley River Steward David Deen as one of the citizen representatives to the newly formed Decommissioning Panel. The Panel began meeting in the fall of 2014 and will continue to meet four times per year. All meetings are open to the public. Keep an eye on our web site where we will announce those meetings. The biggest concern for the Decommissioning Panel is dry cask storage of spent nuclear fuel rods. These rods will sit on the shore of the CT River for thousands of years. How one protects the river over that timeframe is an impossible question given what nature might cause to happen with the river, what nature might do to the casks themselves and the site where the casks are located for those eons. A shorter term emerging issue is whether or not Entergy will continue their monthly sampling from all 32 groundwater monitoring wells and three drinking water wells until the plant is fully decommissioned. Entergy sends some of these samples to the state for testing. Entergy has not committed to fund the monitoring program beyond April 2016. Entergy said it is not required to provide the test samples to the state under federal regulations. For now, the company says it will keep the monitoring in place. The state, with advice from the Decommissioning Panel, will discuss what happens in the future with Entergy. Our concern is the potential for contamination of the river from all the sources on site, those we know of and those we do not yet know of. Another situation that could affect the river are the 1.3 million gallons of contaminated water stored at the site, previously used to cool nuclear fuel. There are also thousands of linear feet of pipes, tanks and other system components containing dry radioactive materials. Any of these situations could affect the river with nuclear contamination. How Vermont will deal with the safety and health of the river will be in part based on the recommendations of the Decommissioning Panel. After constant and consistent prodding from CRC, VT Agency of Natural Resources (ANR) finally issued a new more protective thermal pollution discharge permit for the hot water discharge at Entergy Vermont Yankee on October 13, 2014. Members of CRC have long struggled to see our views represented in the terms of any permit. Despite the inequality of money and legal talent each side had at their disposal, CRC has done well for the river by successfully challenging the junk science put forward by the giant multibillion-dollar corporation, Entergy VY. On March 28, 2014, Vermont utility regulators issued an operating license for Vermont Yankee that set out the terms for the closure and decommissioning of the facility. Thanks to your support, we were at the table for this proceeding since it began in 2012, represented by our attorneys from the Vermont Natural Resources Council. Our work in this case demonstrated the flaws in Entergy’s case for continuing its thermal pollution. Our position and reference to our supporting studies were included in the briefs by both the Agency of Natural Resources and the Department of Public Service. That is a big win and the first time we have been on the same side as the State in this case. The regulators made it clear that based on the evidence presented by CRC and others, Entergy needed to renew their thermal discharge permit even for the short duration before shutdown. That was a victory since Entergy claimed throughout the proceeding that they had a permit and it should stay in place unchanged. CRC argued successfully that ANR had every right, in fact a responsibility, to review and change the terms of the 2001 permit that expired in 2006. 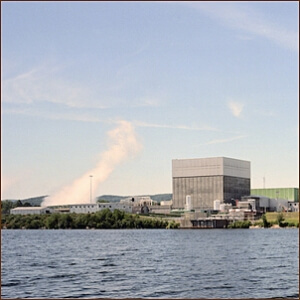 Vermont Yankee’s previous, expired discharge permit allowed them to heat the river up to 13 degrees during winter months and up to 5 degrees in the summer and fall. The plant was able to discharge up to 543 million gallons of heated water a day, some of it at 105 degrees, even though the plant was built with cooling towers that, if used all the time, would stop this pollution. That heated plume extended 55 miles downstream to Holyoke, MA. This level of intense discharge will no longer happen now that the plant is not producing power. There will, however, be a residual amount of thermal discharge since Entergy must keep the spent fuel storage pool cool, but that discharge is expected to be less than 1% of the flow of the river. One of the important wins for the river in this case is that the Agency of Natural Resources is now thinking very differently about how it evaluates, permits, and enforces thermal pollution discharges. This is important because there will be other cases where the Agency needs to regulate thermal pollution and this permit has the opportunity to set out a new and stronger course for the Agency. There is now precedent for future thermal discharge permits to reflect the reality of the river based on the biological needs of fish as they grow, breed, and migrate. That is important for the river now and into the future. The discharge of hot water like that at the Vermont Yankee nuclear power plant poses a serious threat to river ecology. Heating up your river confuses and weakens fish. Fish and other aquatic animals look to changes in water temperatures to trigger migration and/or breeding. Hot water makes it harder for migrating fish such as American shad to travel up the river from the ocean. It is just like a person out for a bike ride or taking a run – the hotter it is the more energy you use. Fish traveling up your river need all the energy they can to successfully reproduce and then return to the ocean. We are concerned that American shad, in particular, have declined significantly over the years in and above the Vernon Pool, the location of Vermont Yankee’s hot water pollution. You can see all the filings in this case at the Vermont Public Service Board electronic docket.